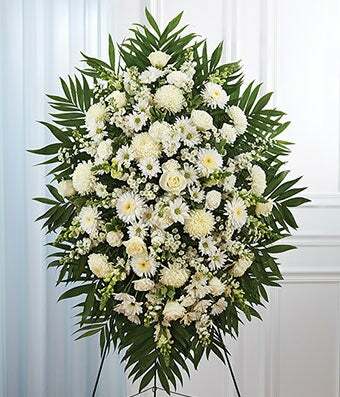 A beautiful white floral standing spray arranged by a local florist for hand delivery, to send your thoughts of care and concern. Created with seasonal white flowers including roses, snapdragons, carnations and football mums. These sympathy standing spray is arranged on a wire stand, a perfect gift to send to a family member or friend who recently lost a loved one. Delivery today is available for standing sprays. Medium (shown) measures approximate 46"H x 38"L.